Canadiens forward Brendan Gallagher (11) tries to sneak between Florida Panthers defenseman Dmitry Kulikov (7) and teammate goalie Scott Clemmensen (30) during their matchup Dec. 15. 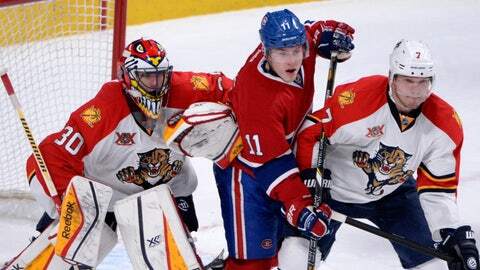 The Florida Panthers topped the Montreal Canadiens earlier this month during their longest win streak of the season. They’ve cooled off considerably since then but will likely have their top goaltender back on the ice for their next game. After missing much of December with a groin injury, Tim Thomas will try to pick up where he left off in Sunday’s visit from the Canadiens. Florida (14-20-5) held on for a 2-1 win in Montreal on Dec. 15, with Scott Clemmensen needing to stop only 17 shots. The Panthers, however, have struggled to contain opponents during their current three-game losing streak, allowing a combined 15 goals. It was speculated Thomas might return to the lineup Saturday against Detroit, but it was Clemmensen who got the start and gave up two goals early in the third period in a 4-3 defeat. Sean Bergenheim helped Florida rally from an early 2-0 deficit with one of his two goals, but the Red Wings tallied twice in the first 1:20 of the final frame to take the lead for good. "We showed a lot of battle," center Nick Bjugstad said. "We fought back and worked hard. Unfortunately, it didn’t go the way we wanted it to." Thomas was on the bench for that game after being activated from injured reserve during the Christmas break. He’s been out of action since a 3-2 shootout win over Detroit on Dec. 10. Before his injury, Thomas gave up a combined five goals during a personal three-game win streak. He’s 9-4-0 with a 1.83 goals-against average in his last 13 starts against Montreal, including seven in the 2011 playoffs while leading Boston to a Stanley Cup. If he gets a long-awaited start, Thomas will try to help the Panthers avoid their longest drought without a point this season. Florida lost nine in a row from Oct. 22-Nov. 10, but earned four points during that skid. The Panthers lost in each of last season’s two visits from Montreal and fell behind 4-0 after two periods in a 5-2 loss March 10. The Canadiens (23-13-3) enter this game having split their last eight but have also earned back-to-back victories, both on the road. After winning 4-3 in overtime over Nashville on Dec. 21, Montreal edged Tampa Bay 2-1 in a shootout in its return from the break Saturday. "I really appreciated our team effort," coach Michel Therrien said. "The energy was there right from the get-go. Guys competed hard, they were quick on puck, and we didn’t force plays when we didn’t have to." Carey Price earned his fourth win in five games by making 23 saves and stopping all three attempts in the extra session. Therrien could be tempted to stick with Price, who is 3-1-1 with 0.98 GAA in his last five games against Florida. Peter Budaj is 1-4-1 with a 2.43 GAA in six lifetime matchups.